Summary: This Psalm is based on the benediction that the Lord gave to the Hebrew people at Sinai. Now it is our song for God’s blessing rests on us. Through Christ, He reached out beyond Israel, inviting all nations to receive His grace and blessing. Paul was His chosen instrument to bring the Gospel to the Gentiles. Rather than fearing the harsh glare of His judgment, we welcome God’s face shining upon us in love. For Jesus’ sake, each of us who justly deserves to be condemned as the chief of sinners (1 Timothy 1:15) rightly claims the title of God’s beloved in whom He is well pleased. Text: May God be gracious to us and bless us and make his face to shine upon us, that your way may be known on earth, your saving power among all nations. Let the peoples praise you, O God; let all the peoples praise you! Let the nations be glad and sing for joy, for you judge the peoples with equity and guide the nations upon earth. Let the peoples praise you, O God; let all the peoples praise you! Audio: Click to hear the MP3 of Brilliant Blessings. 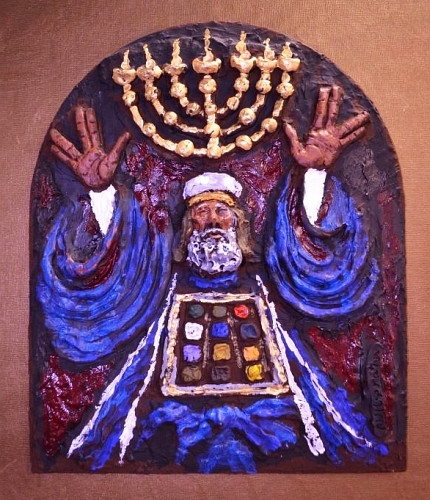 Illustration: Bas relief of the Aaronic Benediction from The Ratner Museum.